Yellow pear cherry tomato. The kids like this variety, and it grows well. I get the same kind at Fred Meyer every year. Flowers as of June 5 2015. 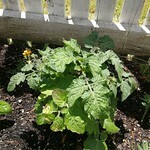 The plant is at the top of the tomato cage. July 7 - the plant is way over the top of the tomato cage. I thinned out the foliage that is growing inward, and near the bottom of the plant. There was 1 ripe tomato, also.